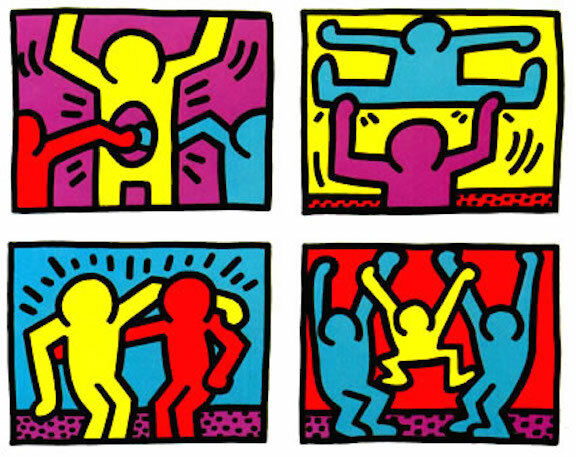 Keith Haring’s Pop Shop works of art make him one one of the most widely recognized and influential artists of the 80’s. In 1986, Haring opened up his own fun-filled boutique, Pop Shop, which he saw as an extension of his work, allowing his art to be easily accessible to everyone. Murals covered from wall to wall, floor to ceiling, along with affordable clothing and gifts featuring his unique iconic bold glyphs. And for the next 20 years it continued to strive as a downtown attraction. 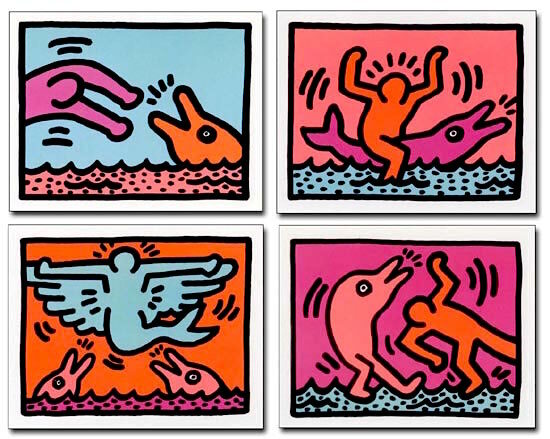 Classic of Haring drawings, they’re all cartoon and storyboard type drawings crammed with animated and highly stylized figures engaged in all sorts of ritualistic motion. Keith was inspired and encouraged by his father’s cartoon drawings. 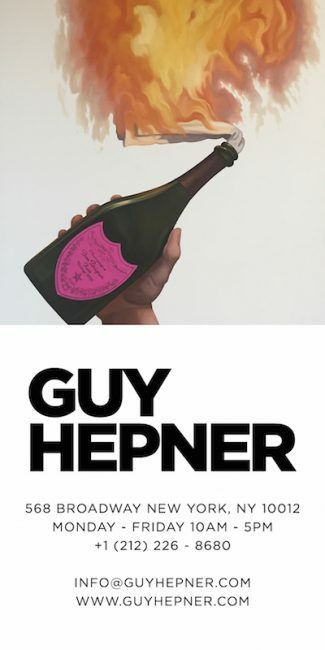 He found the iconography to be spontaneous, truthful, and real. When Keith first arrived in New York, he was ready to absorb the energy of the city, the messages in the streets, and the subculture in subway trains. The constantly changing rapid fire media blitz of graphic images of news, TV, radio, Broadway musicals, politics, cigarette advertisements became his muse when he noticed them in the subways and immediately saw this subterranean metropolis as his canvas. 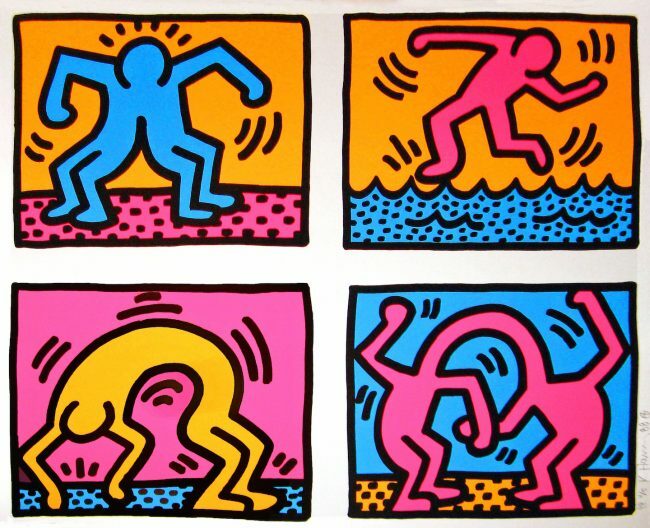 Only Haring brought it upon himself as an artist to compete and broadcast alongside the constantly changing rapid fire media blitz. Every morning on his way to school he would race to the trains with his chalk and hunt down the empty panels at every stop from Brooklyn to Harlem, covering them with spontaneous images which included cryptic messages with clear subversive conceptual and political implications. He saw this massive underworld as a true museum of the people. Full of guts and heart, Keith Haring lived and acted-out in the “Real World” and in the “Open City.” This was key to his genius. The fact that he was able to communicate to so many generations and cross so many cultural boundaries.Art is nothing if you don’t reach every segment of the people.” he says. Haring recognized and celebrated that tribal energy, and truly embodied the vitality that is the heart of America.